The Vatican's official recognition of the State of Palestine in a step to a new treaty has evoked disappointment from Israel which says that an accord signed in such a way hurts peace prospects in the Holy Land. The Vatican said, however, the signing of the accord does not mark a new stance on its position in the Israeli-Palestinian conflict and is part of its reconition of a two State solution for the two entities. The Holy See and the State of Palestine on May 13 signed agreement on the text of a treaty regarding the life and activity of the Church in Palestine, which is expected to be signed soon by both parties, the Vatican announced. 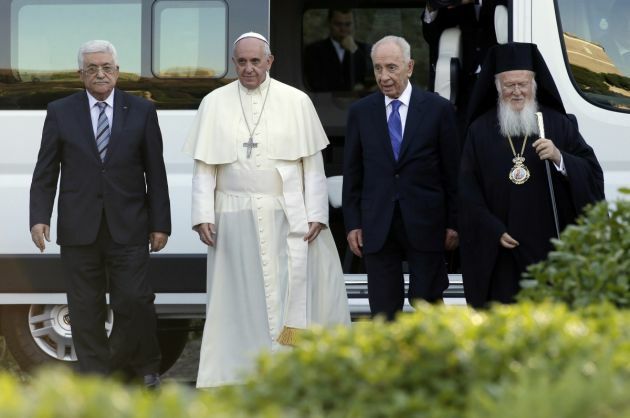 Much attention has been given in the May 13 announcement to the Holy See's reference to "the State of Palestine" rather than the Palestinian Liberation Authority, or some other title, Catholic News Agency reported. It is hoped that the agreement will encourage the international community to acknowledge an independent State of Palestine, alongside Israel, CNA reported. A senior Israeli foreign ministry official stated that Israel "was disappointed to hear about the Holy See's decision to agree on a final text of an agreement ... with the Palestinians, that includes the term 'the State of Palestine'. "This move does not advance the peace process and further distances the Palestinian leadership from returning to direct and bilateral negotiations. Israel will examine the agreement and weigh its actions accordingly." Holly See press officer Father Federico Lombardi told journalists, "yes, it's a recognition that the State exists," so is this a new Vatican stance? The Vatican has been referring to the "State of Palestine" at least since January 2013, and the Annuario Pontificio, the Vatican's official yearbook, lists a diplomatic relationship with the "State of Palestine." The Vatican had welcomed the decision by the UN General Assembly in 2012 to recognize a Palestinian State. So the initial use of "State of Palestine" in an official Vatican text is in line with its longstanding support for the establishment of a Palestinian state as part of a two-State solution to the Israeli-Palestinian conflict. The leader of the Vatican delegation to the bilateral commission is Monsignor Antoine Camilleri, under-secretary for the Holy See's Relations with States. The Palestinian side was led by Ambassador Rawan Sulaiman, assistant minister of foreign affairs for multilateral affairs. Camilleri was interviewed by L'Osservatore Romano about the terms of the agreement, and noted that the Holy See "welcomed the outcome" of the November 2012 United Nations vote which recognized Palestine as a non-member Observer State. "The reference to the State of Palestine and the affirmations in the accord are therefore in continuity with what has been the position of the Holy See," he said. The treaty is, however, the first legal document negotiated between the Holy See and the Palestinian State and constitutes an official recognition, Israel's ynetnews.com reported. The Vatican-Palestinian agreement recognizes freedom of religion in Palestine, and outlines the rights and obligations of the Church, its agencies, and its personnel in the territory said the Holy See. The comprehensive agreement follows a "basic agreement" signed in February 2000. The bilateral commission was established after the Holy See and the Palestine Liberation Organization strengthened official relations. After the 2000 agreement talks between the parties resumed in 2010, aimed at completing the basic agreement. Camilleri said the treaty, "backs a resolution of the Palestinian issue and of the conflict between Israelis and Palestinians within the Two-State Solution and the resolution of the international community." But most of the accord centers on freedom of religion and conscience, as well as the Church's freedom of action, its staff and jurisdiction, legal status, places of worship, social and charitable activity, and use of communications media.